Standing up for our community, not insider interests. 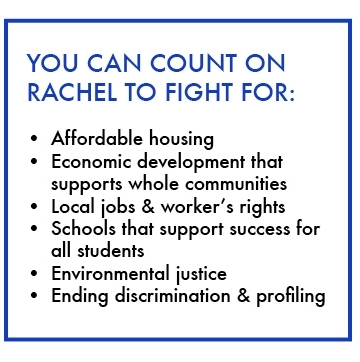 My name is Rachel Miller, and I want to introduce myself and my campaign in the Democratic primary for Ward 13’s seat on the Providence City Council. I’m running because I have spent the last 15 years in Providence helping to lead organizing efforts on behalf of ordinary people, taking on powerful corporate interests and elected officials who had agendas that didn’t reflect the needs of our community. These efforts have made it clear to me how important it is to have elected officials who represent our progressive values -- and in the current political climate, I think this matters more than ever. I grew up on Long Island. My parents were both children of immigrants. My father’s father, Murray, fled rising anti-Semitism and fascism in Eastern Europe in the 1930s. My mother’s parents, Garrett and Ena, left political turmoil and poverty in Ireland. I was raised Catholic, but, growing up, got to experience two communities. One grandmother (although she was born in the Bronx) spoke Yiddish. The other, with an Irish brogue. I learned the real meaning of community celebrating both Easter and Passover with my extended family. I first started to understand the power of community organizing when I was a student at the College of Holy Cross in Worcester. I arrived on campus and sought out resources for LGBTQ students, to find people, who, like me, identified as queer. When I realized that no campus group existed, several of my classmates and I launched an education and organizing campaign. It was hard. It took courage to come out, over and over again, to faculty and administrators, to my dorm mates and classmates. But, it was worth it. Within a few years more students felt safe enough to come out, and share all of who they were, and Holy Cross became one of the first Catholic colleges to officially recognize an LGBTQ student organization. That experience got me hungry for more. I saw what could happen when a group of ordinary people work together to take on entrenched powerful interests and stand together to make a difference in people’s lives. While still a student, I first got involved with Jobs with Justice (JwJ), a national organization that fights for the rights of workers. And I helped launch United Students Against Sweatshops, which pushes for worker and human rights across the globe. What I learned in these early experiences has been a theme of my life’s work for the past twenty years. So much of our lives are defined by whether or not we have power in a given situation -- whether at work, in our neighborhoods, or in the halls of city government. Too many people get left out of decision making that impacts their lives. But this doesn’t need to be the case, and City Hall in particular is a place where we can come together and make sure that the needs of regular people are prioritized over corporations and insiders who already wield more than their share of power. It’s my work with JwJ that brought me to Providence a few years later -- I moved here in 2003 to become the Executive Director of the Rhode Island chapter of JwJ, and moved into our neighborhood a few months later. At RI JwJ I led citywide and statewide coalition campaigns for workers’ rights and for economic development policies that benefit our entire community. We pushed for affordable housing and better jobs for Providence residents. We even sued the mayor for refusing to enforce an ordinance that says that projects subsidized with local money should hire local workers -- and we won. We organized with service workers like janitors and hotel workers to improve their wages and reduce arbitrary firing. We turned out thousands of people to more rallies and picket lines than I can remember, as we called out employers who created exploitative working conditions -- and the powerful politicians who enabled them -- and helped people organize unions, pass legislation, secure wages that had been stolen from them, and otherwise improve their lives. I came to Providence wanting to put down roots, and through my work with so many community members and organizations over the years I’ve done just that. Since working with JwJ, I’ve consulted with Direct Action for Rights and Equality and unions representing childcare providers and janitors. I currently work with the Providence Youth Student Movement, helping to raise money for their youth led social justice programs, and with Building Futures where I work to build a mentor and support program for women who are beginning their careers in building and construction trades. A few years ago, I helped start the Rhode Island Working Families Party, which has helped elect progressive Democrats running against entrenched incumbents who had abandoned the interests of their communities. And though we didn’t foresee Donald Trump’s election at the time, RI WFP has become one of the key local seats of the national resistance to his reprehensible agenda. And this spring I was elected to the board of Urban Greens, a new cooperatively owned grocery store opening up on Cranston Street this fall. The food co-op embodies so much about what I love about our ward- from the many communities represented on the board and in its membership to the many people have pitched in to make access to healthy, affordable food a reality in our neighborhood. During my time in Providence I’ve had the opportunity to work with janitors, hotel workers, child care providers, unemployed people, carpenters, painters, young people organizing against racial profiling, nurses, grocery store workers, neighborhood residents who could not find housing they could afford, immigrants organizing for civil rights, teachers, people with records who could not find work, people of good will from all walks of life organizing for racial justice. My leading opponent, Cyd McKenna, has spent years working for powerful politicians and interests -- working in Mayor Buddy Cianci’s administration in the 1990s, moving back to Providence to manage Cianci’s 2014 campaign for mayor, working for the City Council, and acting as a spokesperson for the new owners of the PawSox in their efforts to secure government subsidies and build a stadium in downtown Providence. I know how to build community power hand in hand with working people -- and how to identify and push for solutions that leave our whole community better off than when we started. In my work, I’ve brought together elected officials, community, academic, and faith leaders to take on some of our biggest problems and to weigh in on the side of justice. Together we changed laws, policy, and lives, and there’s so much more to do. I want to put my experience to work for all of the residents of Ward 13. I love our neighborhoods. Ward 13 is a beautiful and vibrant place to live. Our multi-racial and multi-ethnic income diverse community, our parks, trees, and beautiful buildings, our restaurants and local businesses all make our neighborhoods a great place to live and build community. I also share the concerns of so many of my neighbors that rising rent and unmanageable property taxes will displace families that have made Ward 13 their home for generations. Over the last few weeks going door to door I’ve heard from my neighbors about their concerns with our public schools. I’ve heard from so many people about what they say, ‘may seem like a small thing,’ but when taken together add up to big change- from trash in our streets, to the inability to get a stop sign installed on a busy street. The reality is, too many of our neighbors are still getting left behind. We urgently need to come together, to step up to our best selves, and find the solutions that will make Ward 13 a great place to live for everyone. As City Councilor, I will do just that- I’ll put my experience to work to bring us together and I’ll put my values in motion to be a force for a change at City Hall. I’ll ensure that all of our concerns are heard and we find the best way forward together. I know what it’s like to struggle for economic and housing security. And I know what it takes to take on powerful insider interests to make change, because I’ve been working to do just that my entire adult life. I’ll work hard for all of our neighbors in Ward 13. I will champion progressive values in the choices before the City Council. I will listen and learn from you and your neighbors. I will work every day to represent the interests of everyone, not just the well-connected, in Ward 13. I look forward to talking with you in the weeks to come and asking for your vote in the Democratic Primary on September 12th.